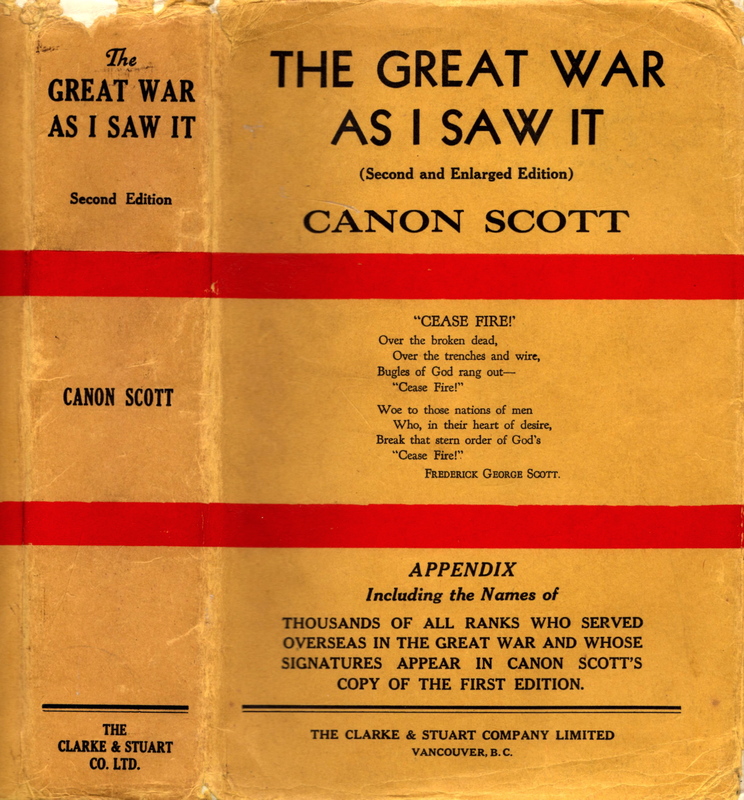 The Great War As I Saw It by Canon Scott 2nd Edition Dust Jacket…. 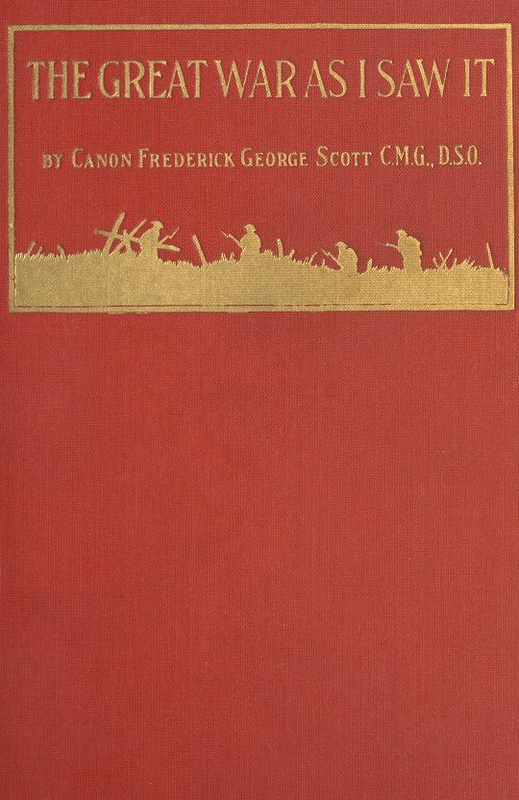 ‘The Great War As I Saw It’ by Canon Frederick George Scott. Vancouver: Clarke & Stewart, 1934. 2nd & Enlarged Edition. 347 pps. Front cover & spine. One of the sub-genres of the literature of the Great War that is beginning to exert its pull upon me is the writing of padres, chaplains, ministers, priests, lay-preachers, and ah…other associated sky-pilots. As a child, my religious instruction was just a hair north of negligent, so at this point I’m surveying the terrain and gathering intelligence. It has been fascinating. What is becoming apparent (besides the depth of my religious ignorance) is just how important this type of literature is to understanding the Canadian experience of the First World War, where men like Canon Scott, Ralph Connor & B.J. Murdoch exert not just regional, but national influence. Religion was profoundly important to Canada’s war novelists as well (which is hardly surprising given the period, not to mention the circumstances). W. Redvers Dent will be best known around these parts as the author of Show Me Death!, but he was also an Anglican minister (who by his own admission, left the Anglican ministry so as not to embarrass the church with the frank depictions of the war in his novel). Many of his subsequent writings were published in Catholic World (New York), and his only other book was 1959’s Reason For Living, a religious examination of modern, cold-war, nuclear-bomb threatened life. Philip Child also has numerous Christian writings that I have been grappling with in the context of his fiction & poetry. 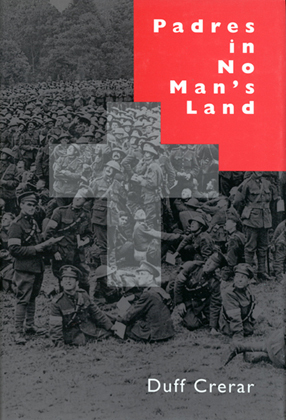 For those interested in the topic of religion on the battlefield, I can heartily recommend Duff Crerar’s Padres in No Man’s Land. One can purchase it through Amazon here. For some reason, the price of the book dropped about twenty dollars a month or so ago. It’s still moderately expensive at $60.oo Canadian, but it was published in 1995 and hasn’t been reissued in paperback (i.e. it ain’t gonna get any cheaper). 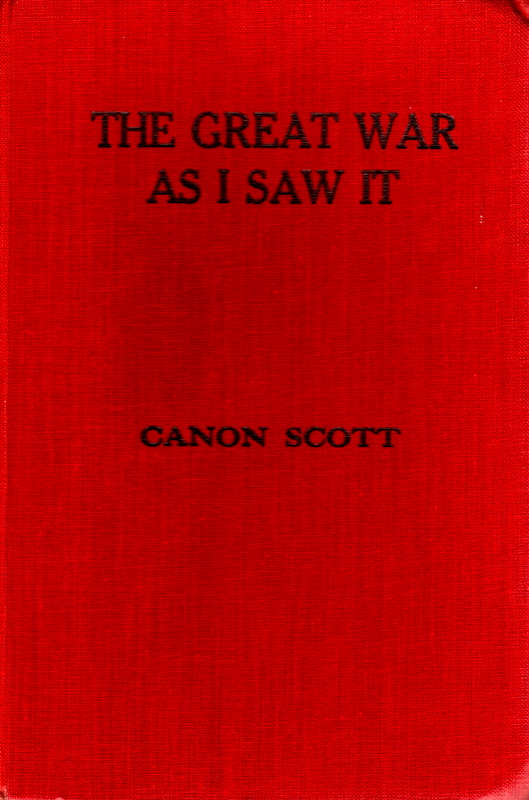 But back to Canon Scott, & The Great War As I Saw It. And bless his heart for doing so. Whenever Scott ran into men he ministered to, be they sergeants or generals, politicians or princes, he had them sign his limited edition copy (No. 46 of 100) of the ’22 edition, which now resides in the F.G. Scott fonds at Library and Archives Canada. There are approximately 4500 signatures in the book, and this list is reprinted in its entirety (in so far as the names were legible) as an appendix to the second, enlarged edition. As per Scott’s wishes, the names appear in the order they are found in his copy. The first is “Edward P.”, the prince of Wales, followed by (amongst others) Generals Byng, Haig, Currie, McNaughton, Allenby, and Admiral Jellicoe. Then there is Billy Bishop, Frederick Banting, and H.J. Vickers, a Sergeant from the cycling corps. It is moving to drag your finger along a random list of 4500 names of men from all walks of life who served in the First World War, who years later stopped and spoke to Canon Scott. I imagine all but a handful of these conversations began with “you won’t remember me sir, but I was in….” And I imagine in all the stories that were told in the years that followed by those men, (and women: there are several nursing sisters listed, my favourite being “Chick”) they ended with some variation on, “and I saw him years later in ….. and he asked me to sign his little book.” Marvelous. Peregrine Acland’s name appears about half way down the right-hand column on page 330. His and T.G. Roberts’s are the only names of Canadian novelists I recognize. The earlier, 1922 edition does not have this list, which is reason enough to to seek out the 1934 ‘enlarged’. There is also at least one additional poem, ‘Cease Fire’ printed on the cover as well as after the introduction. I have not yet gone through and compared the two editions chapter and verse (if you will), but one can only assume that any errors or clarifications would have been addressed in this later edition, which is undoubtedly the authoritative text. Unfortunately, only the ’22 edition appears to have been digitized and reprinted. One can find it at the Internet Archive here, and at Project Gutenberg here. There have been several paperback printings in recent years; if you have one, please drop me a line and tell me if the list of names is included in your edition. Finally, neither of the inside flaps have any text or images on them, hence their not appearing in this post. This entry was posted in Uncategorized and tagged Canon Scott, Dust Jacket, Peregrine Acland, The Great War As I Saw It. Bookmark the permalink.